Finished up my Lila Quilt Friday night, but we’ve had sad overcast weather here in Durham and I was waiting hoping to get better photos. No such luck though, it’s still sadly overcast here, so I’ll have to update this with better photos of the quilting later. The inspiration for this quilt came from the very first quilt book I owned, The Ultimate Quilting Book by Maggi McCormick Gordon. In terms of technique this book is a little out of date, though for a new quilter it does cover basic techniques like binding methods very well with step by step photos. The real value of this book for me though is the veritable treasure trove of inspiration with fantastic photos of a few hundred classic American quilts. For me looking through it is a bit like looking through your favorite flickr group of quilts, but with historical quilts. Seriously, if you need a little treat for yourself, you can get it on amazon for like $6. That’s nothing for 400+ pages of quilt eye candy! 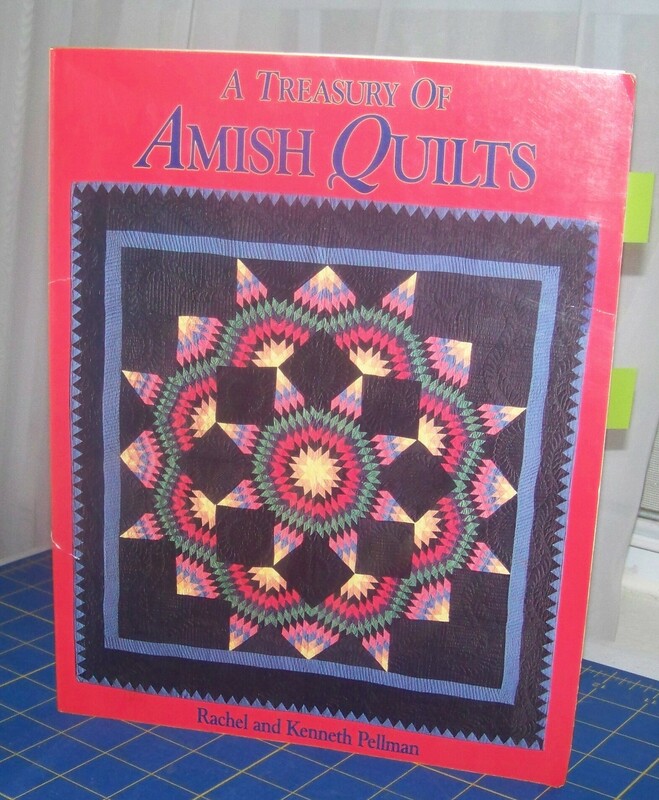 One section that has appealed to me as long as I’ve had the book is Strippy Quilts (pgs 182-189), which is all quilts made of long bars of two alternating colors, creating vertical stripes. The very simple piecing design allows the quilting to be the focus, which I love because the quilting itself is my favorite part of the quilt making process. 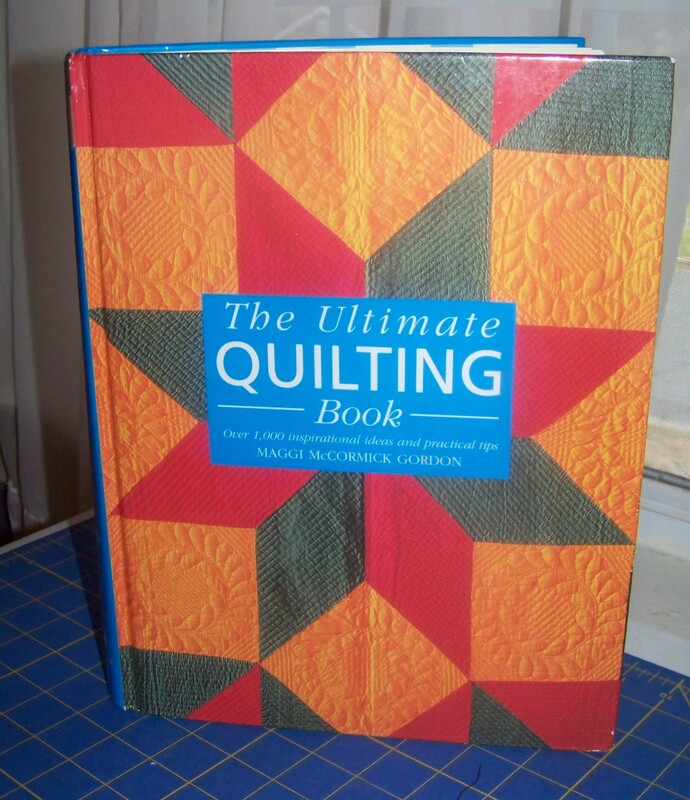 Although the classic quilts they feature were mostly made with two solid fabrics, there is also a strippy quilt in the “how to” second half the book (pg 376), which uses one solid and one print. For Lila, I decided to take that one step further and make my own print, so to speak, by string piecing the “print” stripes. The hand quilted along the seams with cotton perle 8. For the solid bars I borrowed some hand quilting motifs from a strippy quilt, featured in another classic inspiration book I love, Treasury of Amish Quilts by Rachel Pellman. I’ll be blogging more on this quilt later this week, so please check back to find out more. There will be one post covering making the string quilting strips and some ideas on using recycled foundations. Another post will cover the hand quilting and talk about the state of modern hand quilting, featuring some wonderful modern hand quilters who’ve agreed to let me feature their awesome quilts! 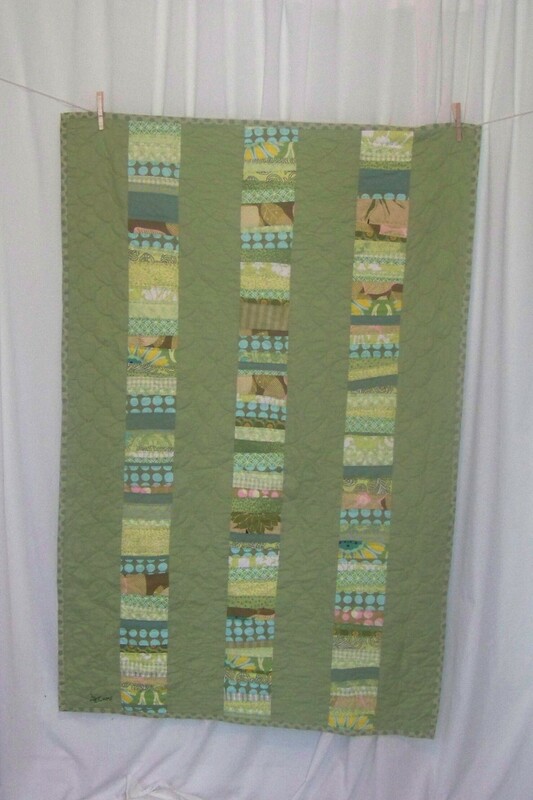 This entry was posted in Quilting and tagged baby quilt, bar quilt, green, hand quilted, string quilt, strippy quilt. Bookmark the permalink. I love the colors, looks like a great quilt for spring. I hopped over from One Thing, One Week, have a great week ahead! Congrats on getting it done, and I know how frustrating it can by to try and take pictures and the sun just won’t cooperate! Lovely! It looks so soft and restful. 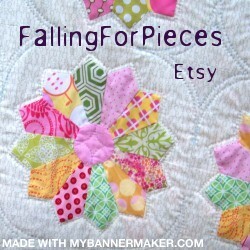 :- ) I like how you describe the inspiration and process to produce your quilt. And I hear you on the light–we had thick sea mist this morning, and it flattened all the colours on my photo. Oh well! Another day, no? this is just so lovely and flowing! it has a very natural feel to it… love it, love it! I love green..this is so soft looking. Very nice. I love that green color. Great choice! It’s beautiful! Congratulations on getting it done.